Sleeps up to 2 – Modern Studio – Incredible Views with Air-Conditioning! All the monuments are there, count them as you relax and take in this breathtaking view on the worlds most beautiful city! 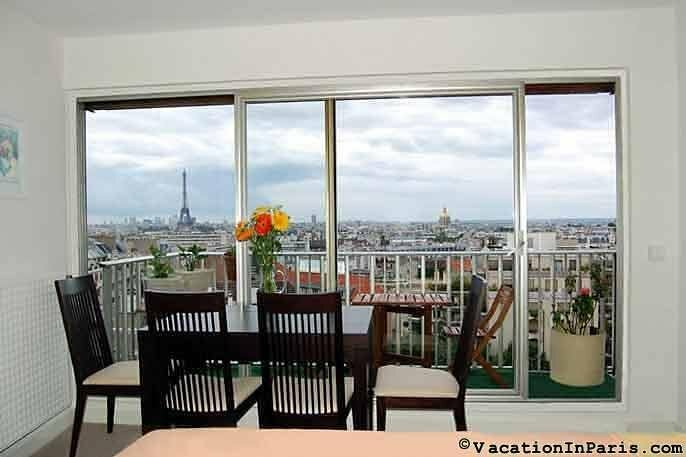 Just imagine sipping your café au lait in the morning with Paris at your feet, or dining outside on the large terrace on a warm summer evening with all of Paris glowing before you. 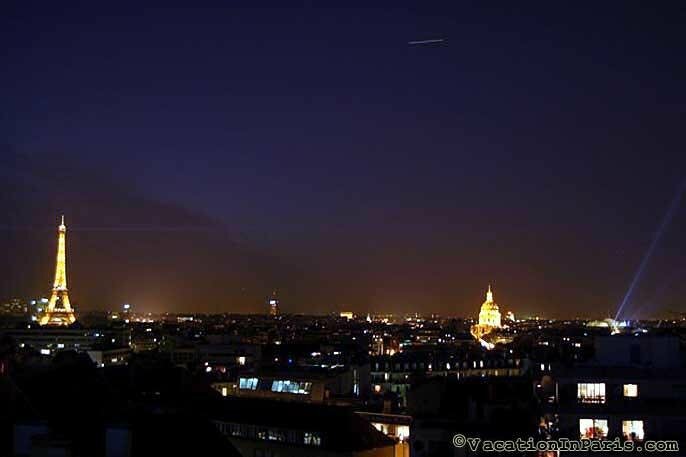 The golden dome of Invalides resplendent with light, the illuminating halo effect of the Grand Palais, the many churches lit with a soft glow, the impressive Arc de Triumph and last, but certainly not least, the central beacon of the Eiffel Tower shimmering as it performs an hourly show of sparkling lights. All this to be enjoyed and savored from your own apartment balcony. 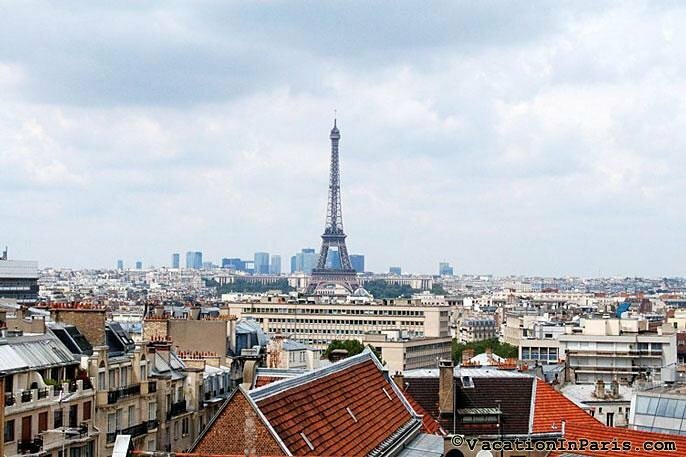 This is where your Paris dreams come true! 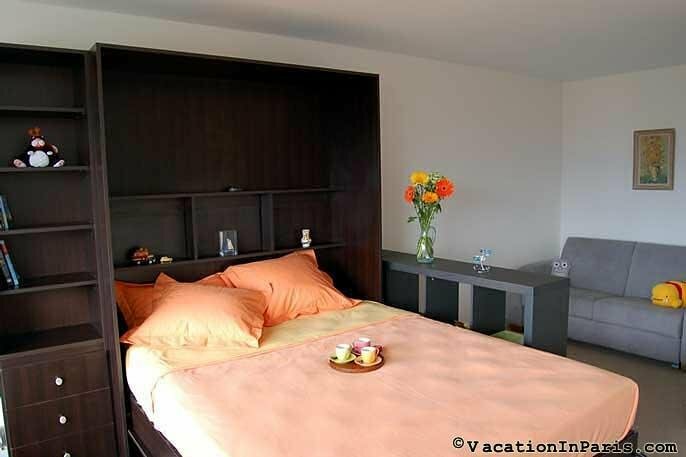 This is a clean, modern apartment, with a nicely updated and equipped kitchen and newer furniture, including a large queen size Murphy bed in the living room. Sleek, modern design with elegant taste, with just enough space to comfortably sleep 2 adults. 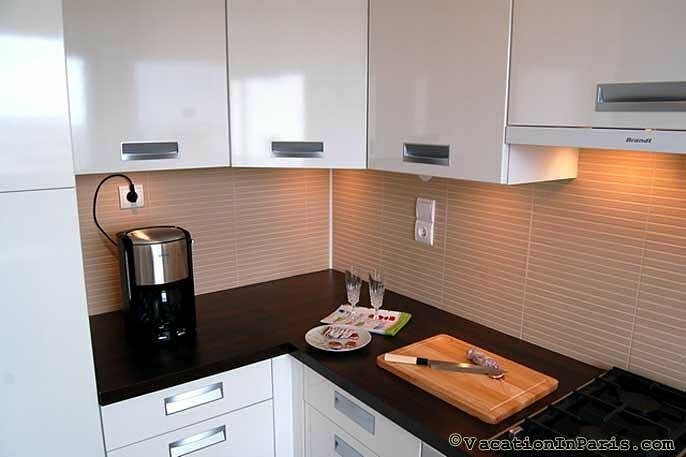 The kitchen has ample counter space and includes an oven, gas stove top, large refrigerator, microwave and coffee maker. 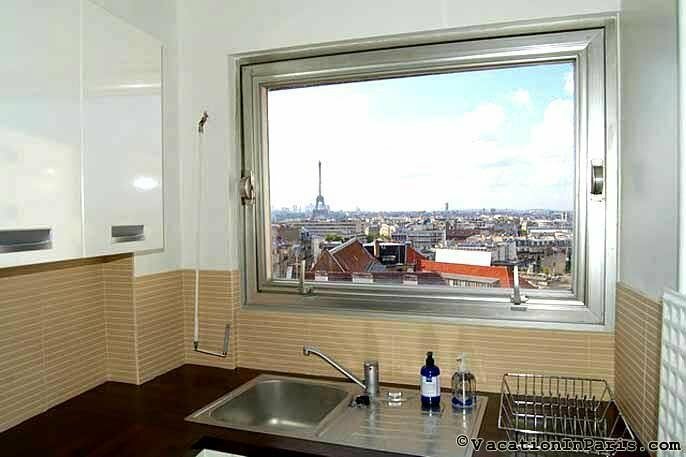 It is separate from the main room and has its own window to view out on the city as well. 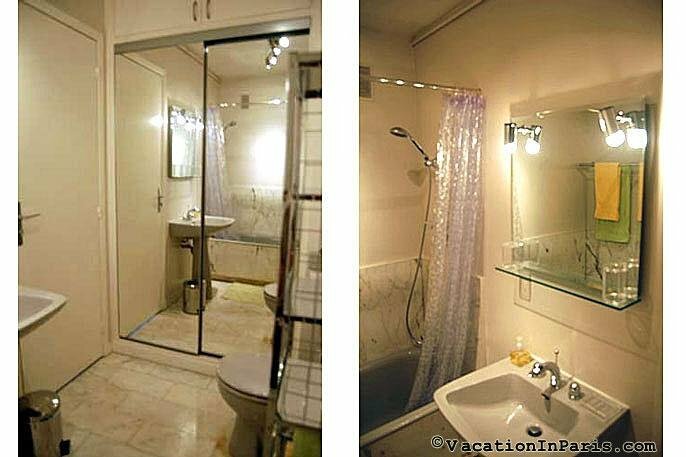 The apartment is completed by a large bathroom with bathtub and attached shower. What makes this apartment seem even larger, is the generously sized outside balcony. Plants and a teak wood table and chairs make this an added bonus in the warm weather months. The large sliding glass doors onto the balcony allow you to take in the expansive views and fill the apartment with a light and airy feel. 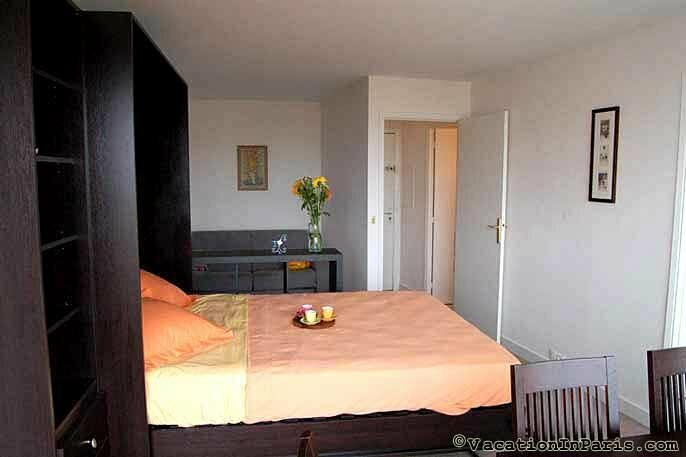 This is the Montparnasse area, with the very convenient train station and several metro lines in just a few minutes walk. There are 4 metro lines to choose from to take you in just about any direction you wish to go. The area also boasts several popular restaurants and a shopping center close by. The famed St. Germain neighborhood is only a 25 minute stroll, or even the gorgeous Luxembourg Gardens can be reached by foot in only 15 minutes. Come for a romantic stay to this exceptional apartment and create lasting memories with your picture perfect \’to die for\’ views! Additional amenities include: fully equipped kitchen includes: gas stove oven microwave coffee maker clothes washer refrigerator/freezer toaster all dishes, cutlery & glasses, 9 th european floor with elevator (10 th us), free local telephone calls, free calls to north america – except alaska & hawaii, sleeping accommodations: queen size murphy bed, 35 m 2 (about 375 ft 2 ) + 8 m 2 of terrace, air-conditioning unit, cable TV with some english channels, iron/board, extra cleaning service available for additional fee (the apartment is clean on arrival), solid wood dining table for 4, double glazed windows with shutters to block light at night, large terrace with teak table & chairs, linens & towels.